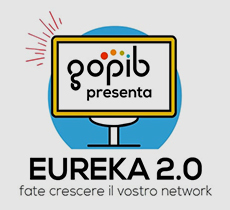 Our Eureka 2.0 initiative ended on February 28th. If you were a participant you may still login with your user account to monitor your status. We are in the process of planning an Eureka 3.0 initiative with all your suggestions! W What are the advantages for you? have exclusive control over the monetization of your content. take advantage of a special offer: pre-order your GoPIB site and you can take advantage of a 2-year subscription instead of 1 at a price below cost. We offer a total of 500 individuals the possibility to join our private equity crowdfunding initiative (200 in Italy, the rest distributed internationally). As of December 2017 over 130 have joined GoPIB F Srl and we are closing an additional 50/70 investors within March. For a total capital of 2 Million Euro. The opportunity for a high ROI. Please ensure that you are a human!